Stampin' Up! Graceful Garden with some vintage inspired texture. This week I was lucky enough to attend the Melbourne International Flower and Garden Show, which is a really fabulous floral, backyard and landscape gardening show in Melbourne. Seeing all the beautiful floral displays motivated me to come home and finish this card I had started at a friends last Monday. This stamp set is called Gracious Garden and it's from the 2017 Annual Catalogue. I hadn't played with it before, but now I really love it! I coloured it with the Stampin' Blends (light and dark Pink Pirouette, light and dark Old Olive and light Rich Razzleberry). I then fussy cut the image and adhered both the stamped image and stamped rectangle using Dimensionals. I have used the debossed side of the Garden Trellis embossing folder (I really like how this pattern coordinates with the background pattern in the Gracious Garden stamp set. 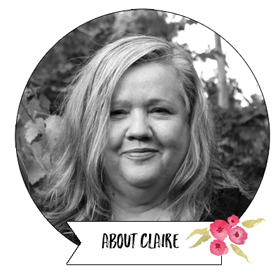 My greeting is from Cake Soiree stamp set and I have stamped in Early Espresso and cut the greeting out with a 1" Circle Punch. A bit of lace tied around the stem and a White Lace Doily finishes off my card. Just One Week Left - don't miss out! 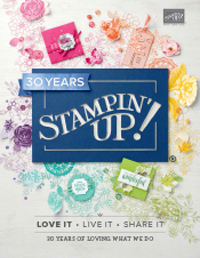 Shop with me and get FREE gifts from Stampin' Up! Read all about the three ways to shop with me HERE. Get two extra FREE stamp sets in the Starter Kit plus FREE postage! Ends March 31st. For just $169 you can join the Stampin' Up! community and my fabulous team. The deal is amazing right now, but ends March 31st, so don't delay! You will get $235 worth of any product you choose PLUS an additional 2 FREE stamp sets (your choice and any value) PLUS FREE postage on your kit. No obligation to sell, do parties or do anything more unless you want to. Plus you will be part of my fabulous friendly and supportive team, and have me as Australia's top demonstrator as your mentor. Contact me for more information or read more HERE. Today some of my Art with Heart Stampin’ Up! team girls are sharing some wonderful ideas to inspire you with our Designer Series Papers. 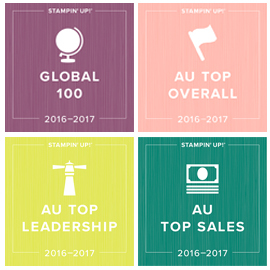 This month is the start of the new Stampin' Up! year and we have a special promotion on our Designer Series Paper, buy 3 get 1 FREE for the month of October and there is no limit! You have come here from Rebecca Jacavou, one of the talented stampers on my team. Blogs are full circle so just keep hopping and there in a full list of participants at the end as well. I am featuring the lovely Fruit Stand Designer Series paper. To be honest, this wasn't a paper that immediately caught my eye, but I received a small sample in a team product share and when I was looking for a paper to use for this card set, the bright colours really caught my eye and now I really like and have ordered a whole pack as part of the special so I can use more of it! My project is a card box which holds four mini cards and envelopes. The box and envelopes are made using our Envelope Punch Board. The box and envelope colour is Cucumber Crush and the card colour Flirty Flamingo which coordinate perfectly with the Fruit Stand DSP. The other colours featured in the DSP are Daffodil Delight, Peekaboo Peach, Pear Pizazz, Tangerine Tango, Watermelon Wonder and Whisper White. The box holds four mini cards and handmade envelopes. The cards are 3.5" x 3.5" and the envelopes are made using the Envelope Punch Board starting with a piece of 6x6" DSP from the 2015-2016 InColour Paper Stack. Here's some quick instructions to make the card box using the Envelope Punch Board. Start with a piece of cardstock 8" x 8". Stamp on this if you wish. I have stamped some of the smaller images from Blooms and Wishes stamp set using Cucumber Crush ink. Place the top left corner at the 3.5" mark on the punch board. Score and punch. Move the top left corner I" to the left (to the 4.5" position) and score and punch again. Rotate the cardstock 90 degrees anticlockwise. You don't need to pay attention to the ruler at the top anymore, just line up each of the score marks and punch and score. Rotate and do this on the other two sides. Using a pair of paper snips, cut sideways on the bottom tabs so they fold inwards, and cut down on the top tabs so they fold downwards as shown. Use a bone folder to crease each of the scored lines, Apply adhesive to the outside of the bottom flap. Fold to close the side flaps over the bottom tab (place your bone folder inside the box and press down on a flat surface to apply pressure for better adhesion). The box closes with the addition of a belly band. Next up on our blog hop is my lovely team member Rachel Woollard in Ringwood East. Rachel is one of my leaders with a growing team and is super creative with her classes and teaching. If you are looking for classes or a great demonstrator to join under, Rachel would be perfect. If you get lost along the way or find any broken links, here is the list of participants. Enjoy hopping with the Art With Heart Team girls today. We'd love to have you join our fun and friendly team. Hobby and business demonstrators are both welcome. We are all about fun, friendship and support. Stampin' Up! Perfectly Wrapped Stamp Set with Pop of Pink DSP - Bright and Cheery! Hello! Let's brighten things up with some bright and cheery cards shall we? Gold is still so on trend and it looks fabulous when combined with black and white and bright pink, as we have in the Stampin' Up! Pop of Pink Designer Series Paper and matching Pop of Pink Washi tape. The bold Perfectly Wrapped stamp set is a great match for these papers. It's super simple to put together a bright and cheery card like this for you card. Imagine giving this bright and happy card to a friend with a bunch of bright pink and yellow and orange Gerbera flowers? My second card is a birthday card. Super quick and simple with the bright elements. The daisies look great stamped on the background too don't you think? The Perfectly Wrapped stamp set is designed to go with the project kit of the same name, but as you can see it works great on it's own as well. Here's a picture of the Perfectly Wrapped Project Kit all made up too. Shop with me online 24/7 or by mail / email and become my VIP. You will enjoy free catalogues, exclusive customer only rewards, gifts, tutorials and inspiration (different to my blog newsletter). August Hostess Code for a free gift with online orders over $50 is 9M2CVRAJ. Details HERE. Bonus Days Coupons. Any coupons you were mailed in July, can be redeemed 2-31st August, No minimum order applies! Stay up to date with all things Stampin' Up! For as it happens news and extra samples and chat with me, follow me on Facebook and Instagram. Sign up HERE to get my blog posts delivered directly to your email inbox each time I post (the BEST way to stay up to date with my blog). You can also sign up for my monthly blog subscriber email newsletter below. Thanks for stopping by today, hope to see you back again tomorrow. Have you heard about the fantastic Thoughtful Branches Bundle from Stampin Up that is a limited time release and available to purchase only between August 2-31st? It makes a fabulous Hydrangea and a whole heap of other lovely things! My purchasing customers received step by step instructions to make this card this month. Place an order with me this month and I will forward you the newsletter with the instructions in too. Here's information about how to order. Here's some more samples using this beautiful suite of products. Here's what's available, but remember it's available 2-31st August only. Also don't forget to use my August Online order hostess code for free gift in September. Shop the Thoughtful Branches bundle in the online store HERE (or enter individual item numbers in the search box if you only want the stamp set or thinlits). Don't have a regular demonstrator or Stampin' Up! Catalogue?Leave me your details HERE and I'll send you a catalogue and keep you up to date with specials and offers. Want to save money or earn money? Join a fabulous Australian wide team of hobby and business demonstrators with great online support - we are all about fun, friendship and support. More information HERE. Subscribe HERE to never miss a blog post post and receive all the latest promotions and news as they come to hand.